Studebaker's Erskine Six, produced from 1927 to 1930 and named for Studebaker's president at that time, was meant to be a compact six-cylinder car that appealed to the European as well as the American market. Its smart styling was impressive and it had its admirers—but it never sold especially well. Mechanical deficiencies, a price significantly higher than that of competitors, and frequent changes to its look and its marketing kept customers away. First the Erskine was touted as a European car, then as a European car built expressly for Americans, and finally as just an American car. Body styles changed year by year, and prices yo-yoed frequently. Though Studebaker was building a reputation for its advanced, well-engineered, and powerful motors, the first Erskines instead were assembled models utilizing a lower-cost Continental engine. Erskine sales were also disadvantaged because Erskines fell in Studebaker's lower-priced market, meaning dealers made less profit on their sales. Therefore, dealers preferred to focus their attentions on more expensive models. 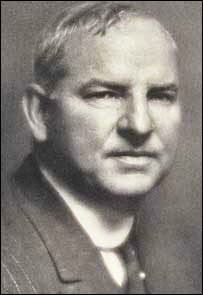 The man who envisioned the car was Albert Russel Erskine, Studebaker's president from 1915 to 1933. Born January 24, 1871, in Huntsville, Alabama, his great-grandfather had fought with the patriots during the American Revolution. The family went on to build a fortune but Erskine's father, who joined the Confederate army at age sixteen, lost nearly everything during the Civil War. After the war he lived in a number of places, eventually settling in Alabama where Albert was born. From there the family moved to St. Louis where Albert went to public school. When Albert reached the age of fifteen, he began his working career, starting out as an office boy for the Huntsville station of the Mobile and Ohio Railroad. By then he was also an avid reader, digging into technical journals and periodicals in the evenings and developing a lifelong habit—that of reading the dictionary daily. One of his jobs at the rail station was assisting the company bookkeeper, and the bookkeeper must have trained him well. Erskine not only did bookkeeping for the rail station, he made a career in finance. In 1898, he left Huntsville for St. Louis where he worked as chief clerk with the American Cotton Co. at $75 a month. When a second bookkeeper left that firm, Erskine said he could do both bookkeeping jobs. He was given the opportunity to do so at the increased salary of $100 a month. Working extremely long hours, he managed to keep up with accounts. Over time he moved on to that firm's New York office as general auditor and operations manager, overseeing three hundred cotton gins in the South. Also while with American Cotton, he married Annie Garland Lyell of Huntington, West Virginia in November, 1903. They would go on to adopt a son who followed a career in writing and editing. When American Cotton went into receivership, the next step for Erskine was Yale and Towne in New York where, in 1904, he became treasurer before he'd reached the age of thirty. He earned a hundred dollars a week auditing books and accounts. In short order he also became a director and member of the executive committee there. From Yale and Towne he transferred to Underwood Typewriter Co. in 1910 where he worked as treasurer, vice president and director. He'd only been at that company a year when a friend of his let him know that Studebaker was looking for someone to fill a job worth twenty thousand dollars a year. Erskine wasted no time in applying for it, and in October 1911 joined Studebaker. As he later related, "I took no office, not even a desk. I spent the first four months out in different departments. I went to the desks of the men in every department and asked them to show me what they were doing, how they were doing it and why they were doing it." His was a tried and true methodology and through it he learned what employees could be sent packing and what clerical operations were either repetitive or unnecessary. He brought satellite accounting branches back to headquarters; he reduced the number of administrative forms from 3500 to 1500; and he recommended staff downsizing. By December 1913, he was elected first vice president and, in July 1915, at age 44, he became president. He had taken over from Clement Studebaker, one of two brothers who'd opened an Indiana blacksmith shop in 1852. The Studebakers expanded their business into building horse-drawn wagons and became major players in that sector. In 1902, however, they entered the car market with an electric car, offering a gasoline-powered car as well a year later. While the first gas model was marketed as Studebaker-Garford (Garford built the chassis), by 1913 Studebaker was selling gas models in its own name. They made both four- and six-cylinder cars. Even as they flirted with cars, however, Studebaker continued making wagons—right up to 1920. Erskine was respectful of the firm, writing its history in 1918. Energetic, optimistic, and efficient, he was fond of saying, "I eat obstacles for breakfast." He developed a plan to make Studebaker a major player in the automotive industry. By 1920, the firm was focusing exclusively on Sixes and, under his direction, the company flourished in the mid-priced field. At the January 1922 meeting of the National Automobile Chamber of Commerce, the association awarded Erskine special recognition as "Baron Erskine, doctor of financial difficulties." All that wasn't enough for Erskine, though. In 1926, sales declined, a fact Erskine attributed to Studebaker not having a toehold in the lower-priced market. His answer was to develop the Erskine. While Studebaker had developed a solid reputation for powerful and reliable sixes, Erskine feared they were somewhat lacking in the "class" department. His Erskine, with its European inspiration, was meant to remedy that. Some said Erskine was clever, kindly, generous, courageous, and forceful while others characterized him as ruthless, dull, overbearing and ill-mannered. He enjoyed a sterling reputation in business, however, and was a skilled leader. The Board of Directors focused on the amount of money he was making and gave him a free hand in running the business. Shareholders thought he was a miracle worker, and no one blinked when he commanded a salary of a hundred thousand dollars or when his talented deputies—vice president of sales Paul G. Hoffman (who, in Los Angeles, had built the most successful Studebaker dealership in the country) and vice president of production and engineering Harold S. Vance (moved up from general sales manager)—were rewarded with salaries of $75,000 each. In 1927 Studebaker hosted a banquet at New York's Plaza Hotel where Erskine, in recognition that Vance and Hoffman were under 40 and that the average age of a Studebaker engineer was 37, said, "I believe in young men. They have what this business needs." Erskine was especially interested in further technical advancements. 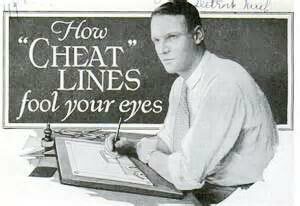 Towards that end, in 1927 he sold off inadequate plants in Detroit, consolidating production in South Bend. He spent more than fifty million dollars in new buildings, moved his engineering staff to new quarters, and spent another million dollars acquiring eight hundred acres to serve as a proving ground. The proving ground was the second in the country, following that of General Motors. Studebaker engineers would go on to utilize the proving ground to test advanced engines that won a number of races and led to a larger market share for the company. In 1928, thinking slumping sales might have been caused by the lack of involvement with the luxury market, he purchased controlling interest in Pierce-Arrow, entering the luxury field. A year later Studebaker's sales were up 78%, putting Studebaker into fourth place in the industry, right behind Ford, General Motors, and Chrysler. Despite his drive to have Studebaker achieve success, Erskine could also be reckless. Having amassed a personal fortune between twelve and fifteen million dollars, he continued to speculate in the stock market. In the business, during the Great Depression, he increased stockholder dividends to inflate stock prices, depleting capital reserves to do so. While his actions were not illegal, they were ill-advised. In 1930, for instance, dividends paid were roughly five times the company's net profits. When such dividends were paid out, Erskine, who held a great deal of Studebaker stock, made money for himself but reinvestment in the company declined, leaving the company significantly weakened. Eventually Erskine cut production and costs, reducing bonuses, slashing dividends, and renegotiating salaries, even his own. Those measures were insufficient to stem the tide, however. So, in 1932, he tried to merge with White Motors. That also proved unsuccessful. By March of 1933, Studebaker was short of cash and couldn't pay its creditors. Banks, facing a nationwide crisis of confidence, wouldn't lend to them. Erskine was forced to sell Pierce-Arrow at a precipitous loss of eight and a half million dollars. The money available from that sale didn't last long, however. So creditors went to court, the court placed the company into receivership, and Erskine was removed from the presidency. 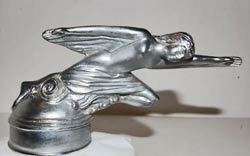 By then Studebaker had fallen to fourteenth place in U.S. automotive production. In a predictable but no less startling turn, Erskine's erstwhile deputies were put in charge, Vance as chairman of the board and Hoffman as president. While all this was unfolding, Erskine was making personal loans to thousands of employees. He'd long been involved in civic affairs—serving as one of the directors of the National Automobile Chamber of Commerce, president of the lay trustees of the University of Notre Dame (his son's alma mater), president of the South Bend Council of the Boy Scouts of America, a member of South Bend's planning commission, and even endower of an 18-hole South Bend golf course. While rescuing employees was a civic mission with a decidedly more personal feel, one man could not keep the Great Depression at bay, especially a man without a job. His troubles multiplied. He was suffering from heart disease and diabetes. He owed nearly three quarters of a million dollars in back taxes. He was $350,000 in debt. His Studebaker stock was virtually worthless. Overwhelmed by it all and looking desperately for a way to provide for his family, he settled on a solution. On June 30, 1933, he committed suicide after leaving this note for his son: "Russel: I cannot go on any longer. Devotedly ARE." Life insurance paid his debts and provided for his family. Let's back up a bit to a brighter time when Erskine hoped to enter the low-priced market. The year was 1924 and Studebaker was consistently showing profits. Erskine took a European trip that fall, visiting Studebaker dealers and automobile plants as a prelude to his stops at the Paris and London car shows. On October 20, at a formal dinner at Restaurant Langer in Paris with Studebaker's European agents, Erskine asked for their opinion as to the ideal car for the European market. Lively conversation ensued and lasted until the wee hours. By the time Erskine departed, he had fixed in his mind that he could successfully market a well-designed, low-cost, six-cylinder in Europe. He also took his message to the press. In the November 30, 1924 edition of the BUFFALO SUNDAY EXPRESS, Erskine explained why the U.S. led in car manufacturing. In Europe, he pointed out, all but a few manufacturers were actually assemblers, buying their bodies and parts from other concerns. American manufacturers, on the other hand, controlled more elements going into automotive production. At the 1924 Paris show, he went on, of 123 makes shown, only 12 were American—and at the London show, American firms represented 23 of the 134 makes shown. It was clear he was eyeing entry into the European market. 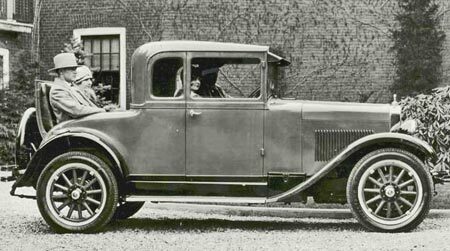 Erskine described the car about three-fourths of all European makers were producing: open cars with short wheelbases, narrow treads, low road clearance, and small bore engines with high compression. Years of investigation, consumer surveys, and testing followed, with Studebaker building fifteen experimental cars and conducting numerous tests at their South Bend proving ground. The board was unanimous in its decision that the new car be named for its president—the Erskine Six. The Erskine, though an assembled car, matched American quality production values and power with European styling and precision workmanship. It was a short-wheel-base (107 inches), compact car, easy to handle on narrow European streets. A number of coach builders, among them Budd, Dietrich, Murray, Weymann, and Gotfredson, turned out the Erskine bodies while Timken supplied many of its chassis components. Delco-Remy was responsible for its ignition unit, generator and starter, Schebler built its carburetor, and Firestone supplied the tires. By mid-1927, a Boyce motometer was also in use. Wanting to keep the car affordable, engineers used straight six, side valve, 2.3-litre Continental engines rather than the more sophisticated and costly Studebaker ones. The 40-horse power engine delivered 60 miles per hour, and the car got 30 miles to the gallon. That was important to European drivers who were paying more than 50% more for their gasoline than Americans were paying. Another advantage the engine offered was that it was 146 cubic inches, with a taxable rating of 16.54 hp. Because European taxes were high, based on the engine's bore, customers wanted to purchase high-revving, smaller cars with smaller-bore engines. The continental was a high-revving engine with lots of pep but an engine with high rpm and a low ratio rear axle is a sure-fire guarantee of significant engine wear. That led to persistent mechanical problems with the car. Priced at $995, the car was marketed as "The Little Aristocrat" and was meant to secure Studebaker's presence in the mid-range U.S. market and expand its presence in the European market. 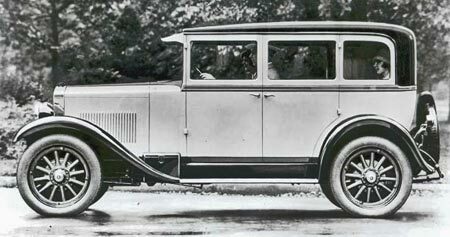 Launched at the Paris Auto Show in October, 1926, United Press proclaimed it the hit of the show. French papers stressed its value as well as its beauty. Next it showed at the Olympia exhibition center in London where it also won rave reviews: "Greatest Auto Value in British History—How Can They Do it?" One noted European body builder wrote this to Studebaker's distributor for Switzerland after the London show: "Frankly, there was nothing much really new there, save one car. . . . . This car is the Erskine. It is unbelievable that a car built in regular production could be as beautiful in finish and design as this automobile." A Studebaker pamphlet compared its features to European classics, i.e., a radiator like the Italian Lancia, a hood like that of De Dion-Bouton, and a battery box like the French Bleriot. The Erskine's styling was European to its core but manufactured to exacting American standards, with what one ad called an "air of French chic. . . considerable of European sophistication. . . something of British sportiness. . . [and] a dash of American alertness." Thousands of orders poured in—but, unfortunately, the European boom for Sixes had leveled off before the Erskine arrived. While initial European interest looked promising, that didn't translate into long-range sales. And the eye-catching car designed by Raymond H. Dietrich never really captured the American imagination. What Erskine was looking for in the new, small car was charm and style to match the car's power and sturdiness. As he once said, though, "style is a fickle jade" (a broken-down horse that can change its mind in an instant), and style setting is a risky business. 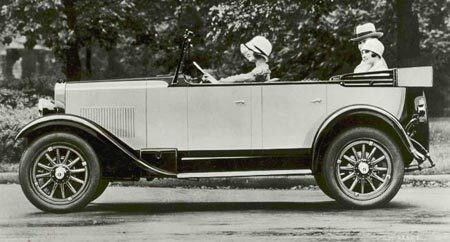 While manufacturers had served up quality styling on luxury cars, it wasn't until the twenties that they began to focus on styling for moderate-priced ones. Rather than leave the Erskine's style to chance, around 1925 Erskine hired custom luxury body designer Dietrich to consult on "body matters". Dietrich designed a car that was neat, simple, and tasteful. In an unorthodox move, he began the styling from the inside out. The car's interior measurements were slightly larger than other sixes of the day, besting makes like Pontiac, Oldsmobile, Chrysler, etc. The car was roomy front and rear and springs supporting four-fifths of the entire wheelbase offered a smooth ride. There were adjustable chair seats in the front, and deep cushions provided comfort for driver and passengers. Door openings were 26-3/4 inches wide, allowing for easy entry and exit. The idea was to give owners the comfort of a big car with the economy offered by a small one. The interior also boasted a lacquered instrument panel with round, black-faced gauges—gas gauge, ammeter, oil pressure gauge, and speedometer. There were compartments at both ends of the dash board for gloves, cigarettes, and other personal items. And it had a larger-size (seventeen-inch), wooden-rimmed steering wheel with black steel spokes and three-lever control—spark, throttle, and headlight dimmer switch. While twenty-three year-old Carl Mosse (student of Chicago sculptor Lorado Taft) designed an Atalanta mascot (a robed woman running at speed) for Studebaker's custom sedans in July 1926, it did not appear on the Erskines—unless, of course, owners paid an extra $2.50. Atalanta was thought to be an ideal mascot since she was the most beautiful Greek woman of all Arcadia as well as the swiftest of all mortals. A princess and fierce hunter, she loved the chase, and when her father asked her to marry, she agreed to do so—on certain conditions. Only a suitor who beat her in a foot race could marry her. Those suitors who lost to her would be put to death. Many suitors raced her and lost their lives. But one suitor—Hippomenes—figured out how to beat her. He appealed to Venus who gave him three golden apples. As Atalanta passed him, he threw an apple ahead of her, repeating this action until all the apples were gone. Atalanta either must have really liked this guy or just wanted to indulge a hearty appetite because she stopped to munch on the golden apples all three times they were thrown. Thus, her time was slowed, enabling Hippomenes to finish ahead of her and claim her as his bride. Moving on to the exterior, the sedan had a low-slung profile with good stability and a low center of gravity. The front windshield curved at the bottom to match the rounded hood line. A prominent, deep and narrow radiator was surrounded by a polished nickel radiator shell and flanked by chrome-plated, two-beam acorn headlamps. 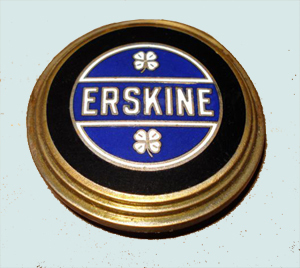 A porcelain Erskine badge (blue ground with two white four-leaf clovers and Erskine written in white block letters) further highlighted the radiator. The central portion of the hood had an embossed, pennant-shaped panel that started at the peak of the radiator and widened toward the cowl. The pennant portion was finished in a contrasting color. On either side of the central hood portion were louvered side hood panels. The car's distinctive trim line crossed the cowl and continued beneath the side windows, wrapping around the rear. Its rear roof line was rounded slightly. There were narrow steel windshield pillars, eliminating the usual blind spot. The windows were long and narrow. The fenders, made of heavy gauge sheet metal, were fully crowned, and flowed seamlessly into the running boards. Stylish Stewart-Warner bumpers appeared front and rear. Dietrich, approaching the car as an architectural whole, thought through use of the entire car. He added a Globe-built compartment for tools and a jack on the left fender and a built-in box on the right fender for the battery. In other cars of that time, the battery was still located under the front seat. A coordinated two-toned paint scheme was another hallmark of the design. The top and fenders contrasted with the body paint. The trim line, a belted molding, matched the wheels (wooden with a small metal hub having an "E" for Erskine). While the earliest prototypes had wire wheels, production models had wooden artillery wheels. Two-tone paint was utilized there, as well, with one color for the hub and rim and another color for the spokes. The window surrounds were the same color as the remainder of the body. To complete the look there were balloon tires, with a spare tire mounted either on the rear or the side of the car. A windshield visor gave the car a jaunty appearance. The rear tail light had a bottom oval reflector inset while the top portion read: STOP. Dietrich designed three basic versions of the car, i.e., a sedan, a tourer, and a coupe. His design team wasn't altogether in favor of some of his choices but, because the sports car was so popular in Europe, he decided to develop some sportier looks. His four-door touring car, for instance, had a rearward-slanting front window with side wing windows; a long, horizontal window trimmed in metal at the rear of the fabric top; and a rear metal roof bracket. The coupe was available in two-passenger or four-passenger versions, the latter offering a rumble seat. 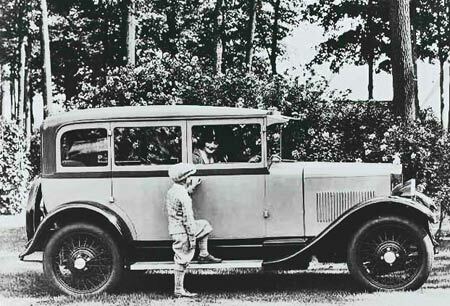 The Erskine was one of Dietrich's earliest production car designs but he would go on to design for a number of marques. From an early age he showed a proclivity towards drawing and, by age twelve, was serving an apprenticeship with the American Bank Note Co., a well-known engraver and printer. As a teen he attended night school for further art training, that training leading him to a job with Brewster & Co. Brewster had begun as a fine carriage builder, later entering the car industry and, in 1905, building its first auto body for a gas-powered car. At Brewster, Dietrich worked as a delineator, translating sketches the staff designers made into non-detailed, full-sized side and front body elevations. When he had free time, Dietrich wandered around the woodworking shop, learning as he watched master body builders. Increasingly interested in the entire design process, Dietrich worked all day before taking night classes at New York's Mechanics' Institute (founded by former Brewster employees) on drafting techniques and technical methodologies used to construct car bodies. He graduated in 1917 and right off the bat found a higher-paying job with Chevrolet where he produced finished technical drawings as well as how-to manuals for assembly-line workers. His efforts there helped him develop a better understanding of mass production techniques. A year later, however, Brewster, found a way to reclaim one of their star designers by offering Dietrich considerably more than Chevrolet was paying him. Back at Brewster, Dietrich met Thomas L. Hibbard, another new-hire assigned to produce body drafts. They hit it off, and, by 1921, were in business together—with a classy new name: LeBaron Carossiers. Their business plan was unusual for the day. They designed "automotive architecture", producing custom designs with a complete package of plans and drawings. The customer could take the plans to a coach maker of choice to have the plans turned into bodies. It was a good idea, and in no time flat, celebrities were lining up to describe the cars of their dreams. Just two years later, though, Hibbard went to Europe to promote sales and stayed on, joining another American in forming European coach design firm Hibbard & Darrin. That left Dietrich with a new set of problems: first, he no longer had a partner to share his growing workload, and second, imitation being the sincerest form of flattery, major coach building firms set up their own in-house design departments to compete for customers. He worked very quickly as a draftsman but he couldn't keep up with demand. Dietrich's solution was to merge with Bridgeport Body Co. in 1924 to form LeBaron, Inc., a company handling both design and coach building. This gave Dietrich a little breathing room, and he was able to develop his automotive styling, styling that led to some of the Erskine's look: a sporty look with lowered roof line and window levels; horizontal flow between driver and passenger areas by means of continuous molding; the car as a total architectural piece; etc. By 1925, however, Dietrich had caught the eye of Edsel Ford who liked the look of the Dietrich-designed Lincoln bodies. 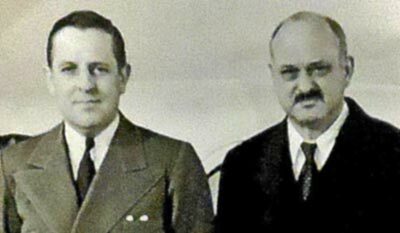 The two became good friends, and Ford convinced Fred Murray, owner of Murray Body Corporation and supplier of some production Ford bodies, to provide funding to establish Dietrich, Inc. Although Dietrich was relegated to a dark office in a Detroit factory, he was not deterred. Besides the Erskine, he would design for Chrysler as their chief stylist from 1932 to 1938 and he would produce body designs, both custom and standard, for Lincoln, Packard, Marmon, Dodge, Kaiser, Checker Cab, and others. After a lifetime in automotive design, he also worked for a short while designing electric guitars for Gibson.